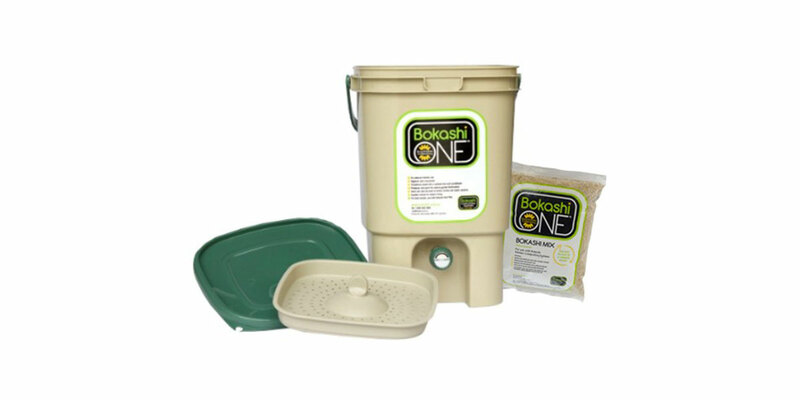 Have you ever heard of Bokashi composting? It’s the simplest, least costly, and fastest way to recycle organise waste when you live in an apartment. Have you ever heard of Bokashi composting? It’s the simplest, least costly, and fastest way to recycle organise waste when you live in an apartment. See our break down of how Bokashi works and a step-by-step for at home use. All you need to do is pick up a Bokashi bin and powder from your local Bunnings. Once at home, put it in a corner of your kitchen and start adding your organic food waste. The Bokashi bin has a tightly-fitting lid which, combined with the friendly bacteria in the Bokashi powder, creates an anaerobic (airless) process to ‘pre-digest’ the food scraps. In simple terms, this means you can keep it in the kitchen because the microbes it produces are almost odourless, especially when compared to normal composting systems. And the bin won’t attract vermin or bugs thanks to the tight seals. In normal compost heaps, you have to be careful not to add too much citrus and you shouldn’t put meat or dairy products in it. In the Bokashi bin, you can add absolutely everything. Just make sure you cut bulky scraps into smaller pieces so they break down more rapidly. When you add your food scraps to the bin, make sure to sprinkle a healthy handful of Bokashi One mix over it. Next, press it all down using the provided trowel — this squeezes out the air and assists with the composting process — and then reseal the bin. After a few weeks, empty the liquid the composting has made via the tap at the base of the Bokashi bin. This juice is filled with nutrients, as well as beneficial microbes so it makes an amazing liquid fertiliser for your indoor plants. Whilst Bokashi bins are wonderful for breaking down your food scraps, it’s important to know they don’t break organic matter down entirely. Use the leftover layer at the bottom of your Bokashi bin as mulch for your indoor plants. If you’re still hesitant to compost inside your apartment, you can seek external sources. Save your scraps for the end of the week then drop them off at your local community garden’s compost heaps. Alternately, many farmer's markets will have an on-site compost heap for all the odds and ends of produce customers don’t want to take home. Many times, if you ask politely, they’re happy to let you add your own scraps to their heaps. Use your Bokashi-enriched fertiliser spray on your own herb garden — find out how to create one here.